Have you ever seen those amazing photographs of the stone monasteries that look like they were carved out of the top of practically vertical sandstone towers? 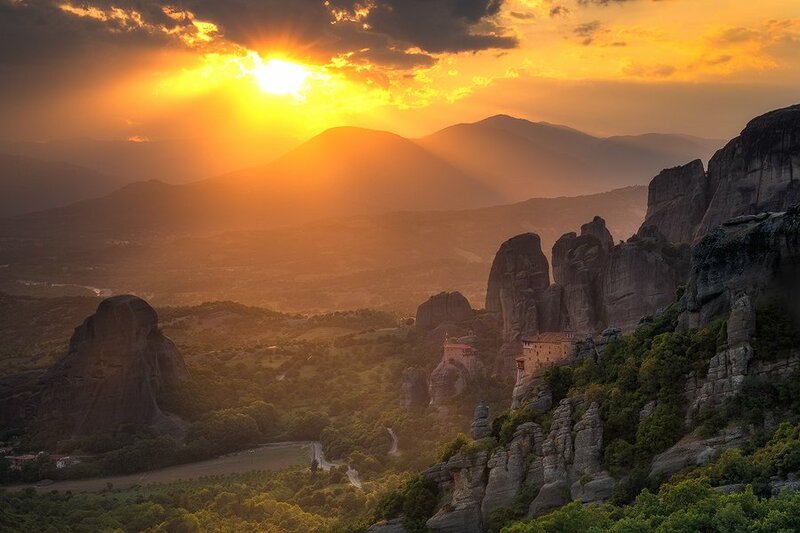 When I first saw these images I was “smitten” and knew that I would some day make the journey to Meteora to photograph this awe-inspiring phenomenon. Meteora literally means “suspended in air.” A fitting description, indeed, for this combined natural and man-made wonder rising out of the Plain of Thessaly in northwestern Greece which is on the Unesco World Heritage List. 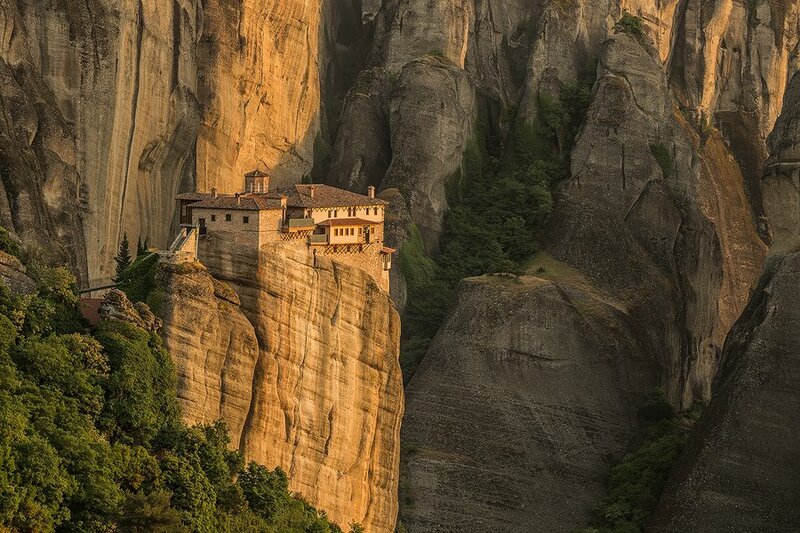 It is a bit of a drive from Athens, about 4.5 hours without stops, but a trip to Greece without a visit to Meteora would be a shame, especially for photographers. Of the twenty original monasteries that were built starting in the 14th century only six remain today. All six monasteries are still active and open to the public. Rousanou is inhabited by nuns and is in our opinion the most photogenic of the monasteries. 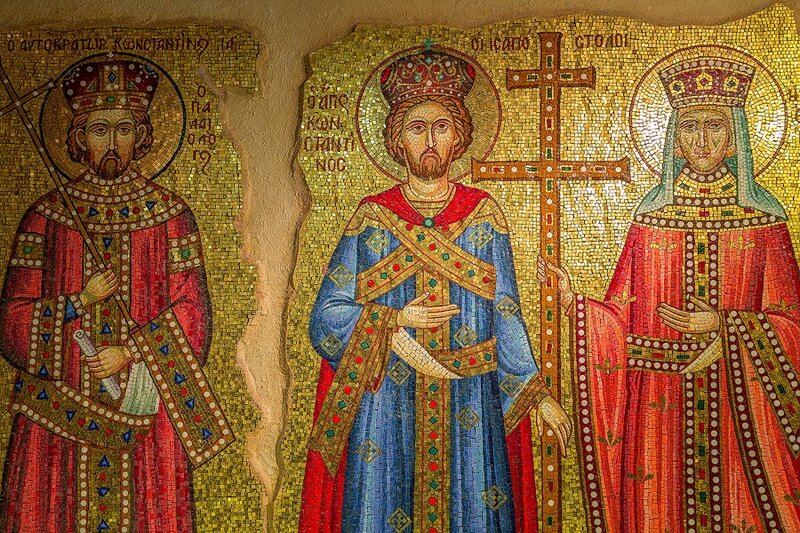 Its interior is filled with beautifully restored gleaming mosaics, wall paintings and icons (mostly depicting the lives, miracles and martyrdom of saints), devotional treasures and historic exhibitions. Mosaics in the interior of Rousanou Monastery. On the day Magrit and I visited the interior of Rousanou Monastery, two nuns were minding the gift store where they sell small devotional crafts items produced by the nuns. Just opposite them a window looked out on one of the adjacent sandstone towers, perhaps 100 feet away. I had to do a double-take to make sure that I was seeing correctly as I spied two rock climbers in brightly colored sports clothing clinging to the side of the 1,500 foot tower. 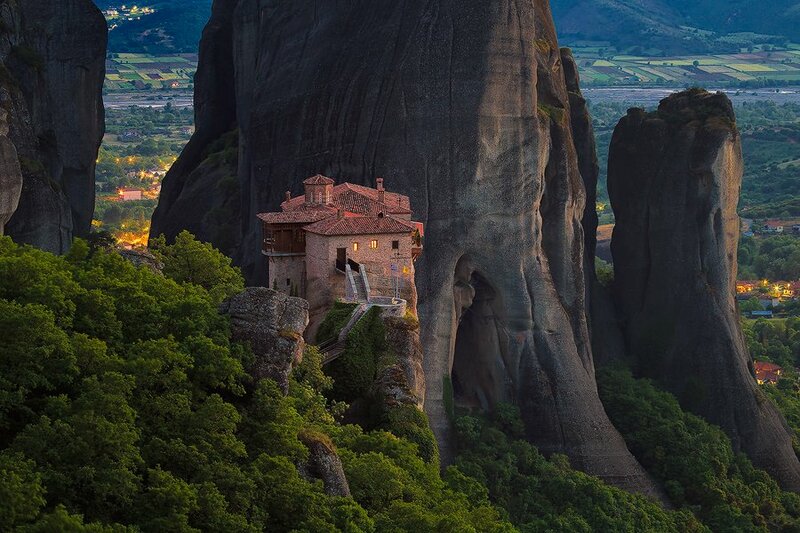 I later learned that Meteora with its vertical sandstone towers is a Mecca for rock climbers from around the world. The nuns did not pay any attention to the climbers but I could not help but wonder if they sometimes, when the shop is closed, watch the progress of the climbers and root (or pray) for their success. The monasteries were originally built in the 14th and 15th century and are being lovingly and expertly restored even to this day. They are an outstanding example of man’s transformation of a natural site into a place of retreat, meditation and prayer. 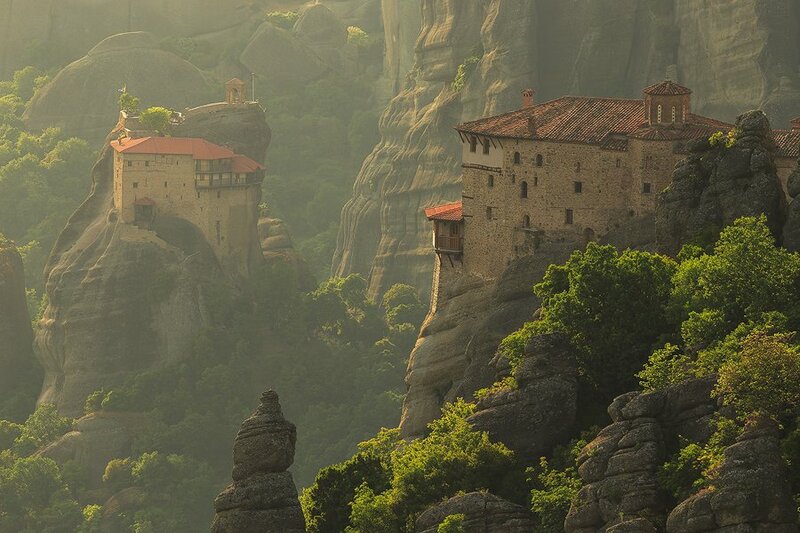 Meteora reminds us of a period in time when the eremitic ideals of early Christianity were restored to a place of honor. For us, this area is a truly amazing visual experience and is an especially fascinating site for photography. A road winds up from the village of Kastraki, passes a couple of monasteries and eventually emerges at a high elevation where you can look down on some of the monasteries and get great vantage points for composing stunning photos. The main town of the Meteora region is Kalambaka but we much prefer the traditional and smaller Greek village of Kastraki, right at the base of the Meteora rocks. From most locations in this tiny village you have great views looking up at the monasteries. Many walking paths leave from here. The hiking is great in the shaded forests below the monasteries. The landscape is quite pastoral, lush and filled with wildflowers — unusual for northern Greece. Some of the higher areas beyond the monasteries even feel alpine with small farms and cows grazing among beehives and vineyards. Right in the center of Kastraki, the friendly Plakias brothers operate a small guesthouse and traditional Greek taverna. On our first evening when looking for a place to eat, this quaint establishment with lovely outdoor seating looked like the hot spot. It was by far the most crowded restaurant and for good reasons. Juicy grilled meats, garden-fresh Greek salads and surprisingly good local house wine (we don’t usually associate Greece with wine). Mama’s baklava alone was worth the visit. Once we discovered this place we did not bother eating anywhere else. There is a real pleasure in frequenting one place for a few days and being recognized and greeted warmly by the proprietors and staff. It is also nice to get treated to a complimentary ouzo or limoncello after your meal. Communication is easy since almost everybody speaks at least a few words of English, has worked overseas or has a cousin in Massachusetts. On this trip, we did not stay with the Plakias brothers but at the very comfortable Dellas Boutique Hotel at the end of town on the way to Kalambaka. This hotel features perhaps the nicest and most modern three star rooms we have ever experienced. Add to that a fantastic breakfast buffet and the Dellas makes for a wonderful place to stay while visiting Meteora. The Dellas is not the only game in town as there are a couple of dozen small hotels and guesthouses sprinkled around the vicinity. 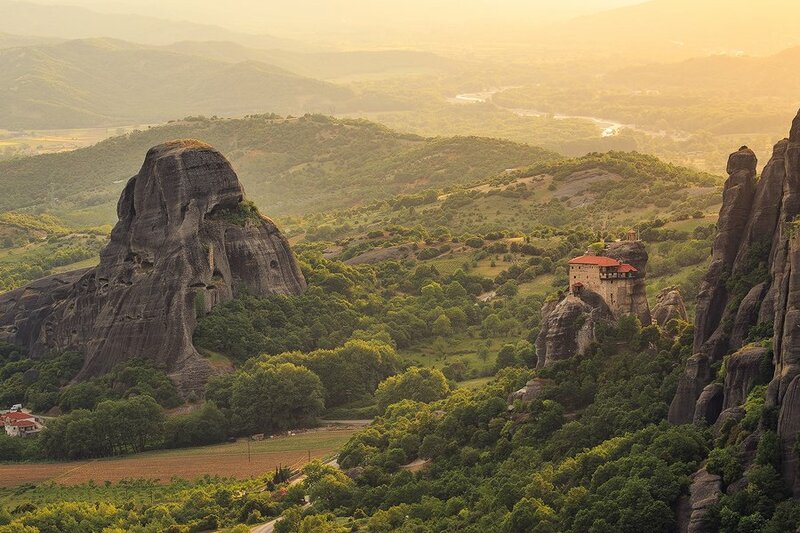 So for us, the combination of the amazing visual spectacle of the six monasteries soaring on top of the vertical sandstone towers of Meteora and the laid-back traditional village of Kastraki, provides a very satisfying Slow Travel experience. 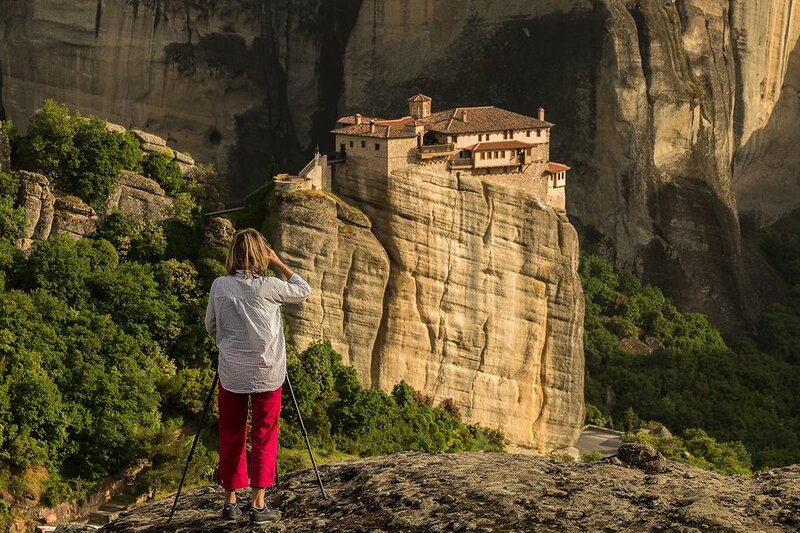 Because we completely fell in love with this breathtaking region, we’re very excited about guiding a photography tour to Meteora next April (4/25–29, 2016), right before our “Ancient Santorini Photo Tour.” Come join us!